My Thoughts: Whoa. 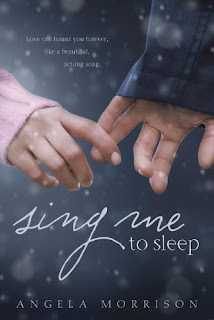 I have read Morrison's previous book, Taken by Storm and while I gave it 4 cupcakes, Sing Me To Sleep deserves 5 cupcakes all the way! We meet Beth who is called The Beast. Everyone thinks she is ugly, nasty, etc. but I never saw her that way at all. She was beautiful inside and she had a great soul. We meet Scott who is Beth's best friend and always has been. They both have feelings for each other but are too scared to act upon them. We meet Derek who is from another town and also doing the choir field trip Beth goes on. By this time Beth has had a makeover and Derek only sees the "new" her. They start to fall in love and Beth goes back home. Derek and Beth continue to see each other but Derek has a horrible secret. I won't say much else without telling you the rest of the story. But this book is a must read for all of you! It had me frustrated, because deep down I wanted Scott and Beth together, but on the other hand I was in tears wanting to know Derek's secret!!! This book is beautifully written and I will continue to read Morrison's books or works of greatness!!! Overall: Loved it! Heartfelt! Must read! Beautiful. Cover: Love the cover! It is beautiful! And the effects on it are great! Reading this one right now, so far its not to bad. It's on my wish list. It sounds fantastic. Great review! I cant wait to read this book. I really want to read it. It sounds wonderful and I love love love the cover!